As Wyoming Goes, So Goes the Nation? 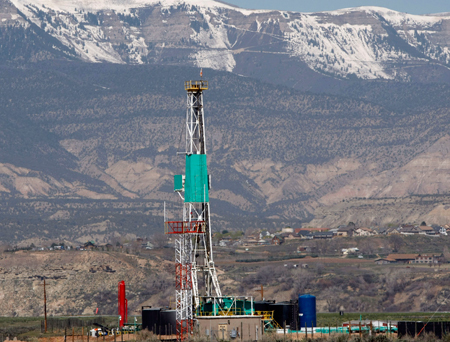 The Wyoming Oil and Gas Conservation Commission voted unanimously last week to approve new rules that require oil and gas companies in the state to disclose the chemicals they use in hydraulic fracturing of underground formations during drilling. The vote is particularly notable in a state where fossil fuels rule, and suggests that even in places where the oil and gas industry is viewed as an ally the catastrophic Gulf of Mexico oil spill may be convincing regulators that tougher oversight is needed. Few states are as deeply wedded to the oil, gas, and coal industries as Wyoming, where the first oil well was drilled in 1884—six years before the Wyoming Territory became a state. Today, Wyoming ranks first in coal production among U.S. states, second in natural gas, and fourth in oil. Taxes and royalties from oil and gas pump nearly $3 billion a year into local and state government coffers, almost $5,500 for every man, woman, and child in the Cowboy State. Coal adds another $852 million to state and local government revenues. Not surprisingly, all that economic clout also translates into political power. As a recent blog posting on the High Country News website noted, “Wyoming is run by the fossil fuel industry,” which is just what makes the commission’s vote so remarkable, if not unprecedented. In deference to the industry’s fears of revealing trade secrets, the commission voted to allow state regulators to not share that information with the public if energy companies can demonstrate it is proprietary. Hydraulic fracturing—commonly called fracking—involves pumping a mixture of water, sand, and chemicals into well bores at high pressure to free gas from tight rock formations thousands of feet below ground. Fracking is now standard industry practice, but it has become increasingly controversial in recent years as drilling has spread to vast new shale gas discoveries and because of aboveground spills of chemicals and suspected contamination of underground drinking water supplies. At the federal level, President Bush and Congress gave the oil and gas industry a free pass on hydraulic fracturing in 2005. As part of a major energy bill, Congress exempted the process from regulation under the Safe Drinking Water Act. Legislation to remove that exemption and require oil and gas companies to disclose the chemicals used in fracking has been introduced in both the House and Senate but is stalled. The draft American Power Act, written by Sens. John Kerry (D-MA) and Joe Lieberman (I-CT), would require disclosure of the fracking chemicals under the Community Right to Know Act. This provision could be included as part of a comprehensive clean energy bill that Senate Majority Leader Harry Reid (D-NV) brings to the Senate floor for debate in July. The Environmental Protection Agency has already started a comprehensive study of the potential impacts and risks of fracking. Though some large energy companies, including Exxon-Mobil and Chesapeake Energy, have publicly stated they favor disclosure of fracking chemicals, the industry has largely resisted efforts to be more transparent. In the run-up to the introduction of the American Power Act, oil giants BP, ConocoPhillips, and Shell Oil proposed adding language exempting fracking from federal oversight. And prior to last week’s oil and gas commission vote, the Petroleum Association of Wyoming said disclosure would put companies at a competitive risk. “If I’m the guy that came up with the formula of Dr. Pepper, and I go out and tell the world, ‘Here’s the formula, go make it yourself,’ that’s not doing me a lot of favors in the business world,” association Vice President John Robitaille told E&E Publishing. The Community Right to Know program has established procedures for reporting on chemical components while protecting trade secrets. But Wyoming has had experience with water contamination incidents potentially linked to gas drilling. Last year, the EPA found that contaminants in several drinking water wells near Pavillion, Wyoming included chemicals used in fracking. Approval of the new rules puts Wyoming at the forefront of state efforts to require stronger oversight of fracking. In a comprehensive rewrite of its oil and gas rules last year, Colorado required energy companies to keep a record of the chemicals they used in wells and make those records available to state regulators in case of spills or incidents that could threaten public health and safety. But these records are not publicly available, and they should be. Energy companies are also feeling increased pressure from shareholders to endorse disclosure of chemicals used in fracking. Strong shareholder minorities of 42 percent and 36 percent have voted for resolutions that would have led Williams Companies, Inc. and Cabot Oil and Gas, respectively, to improve disclosure. Those votes show “that shareholders are deeply concerned about this issue and require more information on how companies are managing the risks associated with their fracturing operations,” said Larisa Ruoff, director of shareholder advocacy at Green Century Capital Management. If the huge BP oil spill in the gulf has demonstrated anything, it has shown that the oil and gas industry has an obligation to be more transparent about how it conducts drilling operations. The Wyoming Oil and Gas Conservation Commission has taken an important step in that direction, and the federal government should take note and follow Wyoming’s lead. Tom Kenworthy is a Senior Fellow at the Center for American Progress.